Comprehensive review of Radha Beauty Miracle Retinol Moisturizer. See how this retinol cream compares against other wrinkle creams! Radha Beauty Miracle Retinol Moisturizer didn’t do much for my skin in the way of moisturizing or helping with anti-aging. The product has a soft and not too heavy consistency that applies easily to the skin. It feels nice on the skin and dries fairly quickly. I liked the applicator a lot, which is a press down pump on a jar. It keeps the product from growing bacteria and it also helps control the amount of product that comes out. About one full pump will cover your entire face as well as your neck and chest, which is nice that you don’t need much product. Short term, I didn’t notice any difference to my skin at all. But over time, my skin became dry and flaky and there was literally no difference to my fine lines or wrinkles. Overall, Radha Beauty Miracle Retinol Moisturizer really only dried my skin out and didn’t provide any benefits to my skin. Radha Beauty Miracle Retinol Moisturizer has a light moisturizing feeling, that is not too thick in consistency. It feels really soft on the skin and spreads out easily on the skin and absorbs semi quickly. I really like the applicator on the Radha Beauty Miracle Retinol Moisturizer; it is a press-pump jar that keeps the moisturizer from getting contaminated. The moisturizer is easy to apply and it doesn’t take very much product to cover the entire face, about half a pump will do. If you want to use the product down your neck and décollete, one full pump is the perfect amount. Radha Beauty Miracle Retinol Moisturizer dries fairly quickly, about 30 seconds, and it feels dry to the touch. Once it’s dry, it feels like there is almost nothing on your skin; it’s really light weight. The smell of Radha Beauty Miracle Retinol Moisturizer is soft and slightly sweet. It’s so subtle though you can barely smell it. It goes away pretty much immediately after you apply it onto your skin. Short term I really noticed virtually no results from the Radha Beauty Miracle Retinol Moisturizer. My skin wasn’t feeling dry or moisturized, I really didn’t see any difference in my skin. Long term I noticed that after a few weeks my skin was flaky and that it was resurfacing my skin a bit. But even though I noticed slight flaking, there was no difference in any of the lines on my face. I didn’t notice a difference in the wrinkles, but I also didn’t even see a difference in the super fine lines. I was disappointed to see that all this product was really doing was drying out my skin. Radha Beauty Miracle Retinol Moisturizer has ingredients that are found in many anti-aging retinol products. It contains Vitamin E which contains antioxidants which helps fight anti-aging. It helps the aging process by fighting off free radicals and protecting the skin from harm. Hyaluronic Acid is one of the ingredients which is known to pack a punch when it comes to anti-aging. It can help de-puff, calm, and treat tired skin. Another ingredient is Green Tea which is another great ingredient known for calming the skin. Green tea contains antioxidants which we know are essential in fighting the aging process. These ingredients are known to be great for fighting wrinkles and helping with anti-aging. 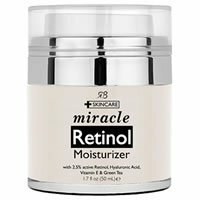 The cost of Radha Beauty Miracle Retinol Moisturizer is $19.95 for 1.7 oz which comes to $11.73 per oz. This is a pretty inexpensive retinol product. Radha Beauty Miracle Retinol Moisturizer has a 100% money back satisfaction guarantee. To buy Radha Beauty Miracle Retinol Moisturizer, click here. Ingredients Vitamin E is great for anti-aging.